Thankyou so much Ibisum, feedback like that motivates me so much. Thanks for your hard work Twilighte! Have just started laying down some code. The first part of the game will be similar to spyhunter. Still vertical but you'll be in control of a truck attempting to get to the airfield in time. Anyway more on the storybook later. But obviously this raises some issues, such as how to control the background objects like railways, bridges, farms, hedges and ditches without it corrupting the road. The answer is to use a script. However again that is for later. I'm not gonna reveal too much about this game until each section is close to looking completable. Ok after a change of heart i've decided to map the road just like the original demo. It means the game runs the same speed as the original demo (very good), is much simpler to code but will use a little more memory for road graphics. Anyway currently i have created all the road verges, and some background graphics. I still have lots of other graphics i already created for the first demo. So that bits pretty much done. On to other stuff. The sprite management engine is a complex beast. It currently handled all sprites including ground based sprites (such as Tanks, vehicles and gun turrets) and air based sprites (such as planes, player crafts, projectiles). To always ensure air based sprites appeared infront of ground based ones, the process was two pass. However just recently i have found a way to make this a single pass method. This means things run faster since instead of two big loops, we use just one. Each Sprite has a number of attributes associated to it such as X, Y, ID, Group, etc. These are all held in separate tables such as Sprite_X, Sprite_Y, etc. and are all 32 long. This means there are a total of 32 sprites that can exist at any one time. The Sprite index runs from 31 to 0 and during this process a unique script is called to process the sprites on-screen behaviour, delete and plot them. This means that sprites appearing at index 31 will appear first(Ground) and at index 0 will appear last(Air). So when we need a new sprite we either insert at the start or end of the list and when we want to delete a sprite we remove it from the list. However we can further simplify the process. For example we have 5 sprites..
With Sprites 0,1,2 being air and 3,4 ground. Now i want another Air sprite, so i find the last air sprite (2) and move the ground sprite beyond it(3) to the end of the list(5). Now i make 3 the new air sprite. Now i want to insert a new ground sprite. Thats easy, just lace a new one at the end..
To delete air sprite 2, i replace it with the last air sprite which is 3 and replace 3 with the last ground sprite which is 6. I then decrease the count by one. Finally to delete ground sprite 3 i replace it with the last sprite 5 and decrease count by one. I've also been back on the background story, deciding on some nice images to appear whilst the story unfolds. I can tell you now that the game will be disk based. Technically it is possible to make it tape based since its very much sequential in gameplay. For example, road to airfield, cut to unfold story, fly to Germany, cut to unfold story, etc. It might have also been possible to load the game from tape whilst playing which would have been so, so cool. Except it would only have worked on the real machine because afaik no emulator would have supported it. Ok a few developments but not anything like as many as i'd hoped. For some reason while my heart is in it my mind hasn't been so much. Got the Motorcycle scorepanel finished (or near to it). The game is spread over 5 levels and each level contains a number of scenes. Well anyway you get the idea. So the first scene has you riding a motorcycle through the English countryside so the scorepanel must be motorcycle based. Scene 2 must be spitfire based. The Rambo scene is not auto-scrolling I guess ? Push scroll. Depending on both players reaching above a certain point. But no back scroll if they retreat. It was good to show some progress for O-TYPE at CEO visu in Paris a couple of weekends ago. Unfortunately since then, due to illness i'd not done much over last week. 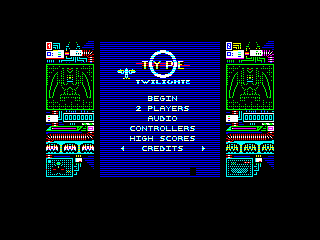 However i seem much better now and have constructed the framework of the game on disk (using dskbuilder). Now setting up the scripts to compile all sections before rebuilding the disk then converting to mfm and booting in the test environement. Since i'm using disk i get a whole load of extra memory for graphics and other cool stuff to chuck at each level. Anyway more info later when i have something working again. I hope you'll make another good rating in retrogamer magazine. i've take one year subscription since our exchange at the visu. I simply cannot wait for O-Type .. its going to be amazing! yeah yeah, well finally managed to get into project. The problem with me nowadays is not so much motivation whilst doing a project or even getting sidetracked but motivation starting such a big project especially now its on disk. Managed to get dskbuilder to rebuild disk properly, convert to mfm and boot. Problem displaying full hires screen but its only test screen so i think its not a problem. Also started compiling the game library. This 'chunk' sits in overlay between C000 and FBFF and holds all those common routines, buffers and tables that the rest of the game will rely on. Lots of compilation bugs but at least its started! is of the same style as will be used throughout the game. 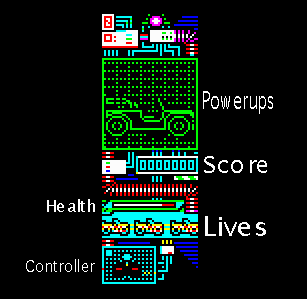 The only difference between levels will be the green window will show the vehicle or guy the player is controlling and the lives will reflect the same shape thing. Anyway the score (shown in the pic in the box just below the green screen) needs some special code since each number is only 3 pixels wide. I did a similar thing in a previous game (forget which one though ). 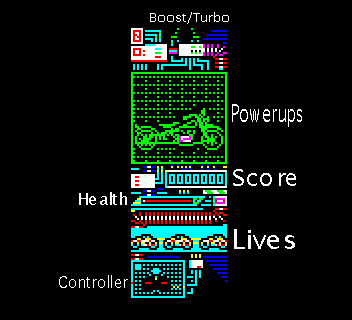 Oh and just incase people are wondering, this is what all the other parts of the scorepanel are. Is it logical and intuitive enough? The Health has been moved so that it is now adjacent to lives, which it is directly related to. I have also removed Boost. Well actually any boost or Turbo feature will be shown in the Green area but when boost or turbo is activated the orb shown will illuminate.